I've updated the spreadsheet with all the entries so far. In the spreadsheet all calculated bandwidths are based on a pulser risetime of 50ps which we now know is quite concervative, especially with Leo's 2nd generation units. As is, the spreadsheet doesn't even handle the 31ps to 34ps figures properly. If anyone want access to it just PM me your email adress and I'll add you to the list. You forgot my post #156 for the HP 1742A in the table. In my post 207 the rise time of Tek 7904 with 7T11 and 7S11 (with S-4) is less than 60 ps (not 80 ps). Here is an other picture with 50 ps time base. That seems slow for a 100MHz 'scope - should be around 3.5ns? It's because the real-time sampling rate is low. Running the 54642D in equivalent time might improve its rise time performance a little too, certainly I've found that on other Agilent/Keysight scopes that support it (e.g. MSO7104B, 54832D). I've updated my reply once again. Works great! Thank you, Leo! I hate that your 1 GHz J-250 (WavePro 950 ish) is faster than my 2 GHz WavePro 960. But I've confirmed a -3dB point just above 2 GHz on the 960 so it does live up to spec. And my overshoot and ringing looks very different than yours. Curious. Can you try the same bandwidth measurement technique that I used in my post? This will show you not only the -3 dB point but also the passband ripple of the scope. It's nice to know those things. You may or may not have deep FFT support on your unit depending on options (look for WAVA or WAVAPRO or WPRO in options list). Can you try the same bandwidth measurement technique that I used in my post? Nice, way beyond spec. And a nice rolloff, not the brick wall that the 960 has. I guess you could change your name to 1.8GHz now. Said in my previous post that I would try it on my Tek R7912AD. This is a single shot transient digitizer with a 500MHz bandwidth (about 1GHz direct access). The 10 to 90% risetime looks to be around 700ps. I have been slightly tweaking the design between the batches to milk a bit more performance out of it. Latest batch of the pulsers that I have assembled today all show risetime and falltime below 40ps. You mentioned a few revisions to get a better performance. I have your Rev E batch rated as 50ps. From the photo I can see a few modifications in the upper right. Is this something that I can retrofit on the old board or would that be too tricky? Current revision is Rev.G and I have modified power bypass quite a lot. So the short answer is "tricky"
The best I can offer you is another one from current Rev.G with a discount. But 50ps is pretty darn fast as it is. 30 and 40 picosecond risetime pulse generators. Related eevblog thread. Since 50ps is already much faster than anything I own right now I'll be OK for the next while! I was just intrigued on how you did it and if it was easily transferable to the previous version when I saw your posting. Now that is quite a beast. I had to look it up and its pretty interesting. Turns out back in 1973 they made this work using a CRT tube with a plate of detectors on the end(That are also read with a electron beam like a vidicon tube) to create a high speed AD converter. Thank you to those who pointed out some mistakes and omissions in the spreadsheet (on and off list). I believe I've fixed those now and I've added the last day(s) entries. Not quite as good as 1GHz's machine, but not too shabby. Out of interest the Lecroy is good for this analysis as it makes it easy to use the output of one maths function as the input to another - that does not seem to be the case for a Keysight DSO1024A or Tenma 72-8725 that I have recently had to play with - it could simply be that I've not figured out how to get them to play ball but both of these 'scopes seem to have fairly shallow memories and only do FFT based on what is on screen. What other 'scopes can do this analysis to show the impulse power spectrum? I was able to convince my Phillips PM3320A (ca. 1987) to do it, but it wouldn't the horizontal of the FFT result as frequency, only as points. 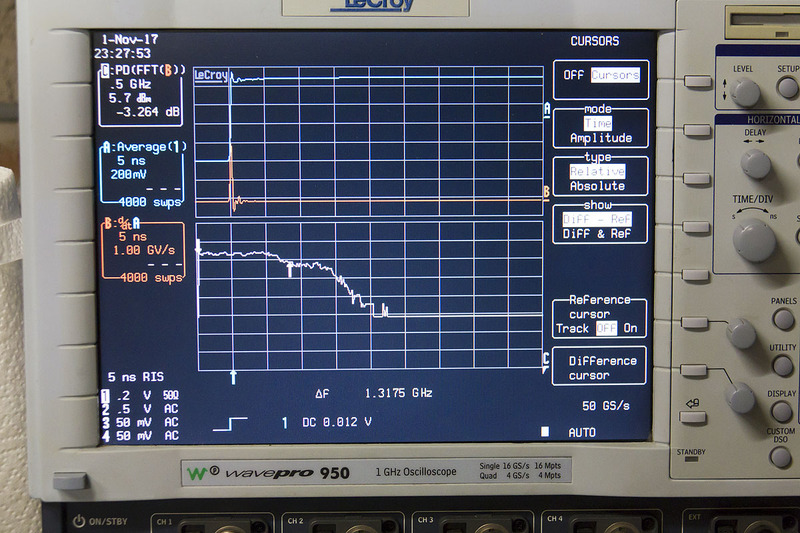 I guess the firmware designers didn't anticipate users doing FFT of a d/dr of a waveform. Anyway the resulting FFT just wasn't as convincing as the WavePro result. I manually measured the -3dB bandwidth as 375 MHz, not bad for a 200 MHz scope. Is your WavePro actually as grey as it looks in the photo? My 960 is a distinctive blue-grey that is actually quite ugly. Blue-grey is about right, no attempt was made for accurate colour balance in the above shot so the camera has almost certainly interpreted the front panel as mid grey and adjusted accordingly. Here i tried the pulsar on a Agilent MSO9204H. Doing a FFT of a derivative is easy here since it has 16 math channels to choose from and each can feed in to the next. About what is to be expected with a rise time of 147ps and the FFT showing a -3dB bandwith at 3.1GHz. With a Leo SMA modded version on an HP 54120B & 54121A combo, 35.6ps. (I was getting about 55ps on the BNC version with a rather generic BNC-SMA interseries adapter of indeterminate provenance). I feel sure I may be able to do better with some experimentation: still it's almost as good as the scope's internal pulse generator (~33ps). That is pretty cool.....especially for a tiny $75 device. Used 0.4 / rise time for the calculation.